Toddlers get a bad press. The ‘Terrible Twos’. Well, that’s not very nice is it? Imagine if someone said: “How old are you?” “Err. Well, thirty-something?” “Ooooh! The Dirty Thirties eh?” See what I mean? It’s rude. And I don’t think we should be talking down the toddler years because so far I am loving it. Little B is SOOO much more fun now he’s got a personality and we can ask him to bring us crisps get him to choose books to look at. I’m not saying I didn’t enjoy anything about the small baby months but since he started walking the interaction has blossomed and he’s becoming a nice little person to be around 90% of the time. The other 10% when he gets frustrated or dictatorial I think we can forgive him. I wrote recently about trying not to say no all the time and since then Little B has become much more considered about his daily exertions. He’s not acting like a terrier on cocaine anymore and actually sits happily playing with his toys or carefully pulling single stems of grass out of the lawn and examining them. Perhaps he hasn’t become a full-blown toddler yet and I will soon have to eat my words, but for now here’s some things I’ve noticed him doing recently that are very sweet! 1. Bringing us gifts. He hasn’t started ordering me desert boots from ASOS or buying his mum a birthday bracelet from Joy Everley but he does like to bring us twigs, or small pieces of biscuit that he’s found in his buggy, or his socks. And we appreciate every present. “Thank you!” we say and off he goes, a picture of contentment. 2. Kicking a ball. YES! I’m now referring to him as Little Beckham – like Little Ant n Dec. Ever since we bought him this toy football he loves chasing it around the garden laughing hysterically, falling over every five seconds and getting straight back up (no shirking or diving here – he’s like a proper 80s footballer covered in mud). Only issue is picking the ball up and trying to put it in his mouth. It’s bigger than his head. “Oi ref – mouthball!” 3. Asking questions. Not in any language we’ve ever heard but Little B certainly has an enquiring mind. “Da?” he asks pointing directly into the sky. “Baaa-aahh?” he gestures vaguely at the TV with a rising cadence. “Where’s my feckin’ milk?” he demands as he leaps onto the sofa in the morning and turns the TV from Good Morning Britain to Chuggington. OK so he doesn’t say that. But he does change the TV channel. 6. His love for other children. 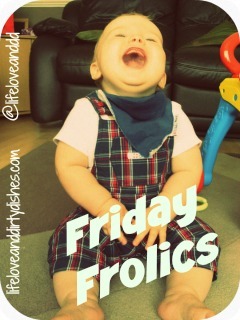 Little B kicks his legs with joy every time we arrive at our childminder’s house. He LOVES her boys who are much older and will happily be subjected to hours of prodding and squeezing and being lifted up. He genuinely seems to enjoy the company of other children. Well, that is unless they are his age. In which case he just moves them out of the way. Just a little gentle push. Thaaaat’s it. You go there and I’ll take your toys/food/drink/parents. I saw him get into a pedal car when the other child was still SITTING IN IT. Plonked himself down and carried on playing. The driver looked most bemused. 10. Hugs. Doesn’t need any more explanation does it? OK. So sometimes he does walk up and then just gently headbutt you but it’s still a hug in his world. Still a hug. Hurty hugs. Oww. But I still love him to the moon and back. Toddlers are enormous fun. I got to babysit my coworker’s 3-year-old twins last weekend, and we had SUCH a good time. However, I have to question your assumption. My babes were full of personality (the same personalities they have today) as newborns. Thank you so much for linking with #TwinklyTuesday. Roscoe has just started offering me bits of his half chewed toast and although it is adorable it’s too rank to consider. I hope I’m not setting him up for a therapy session on rejection. Lovely post. Thank god it’s not all tears and tantrums 😉 Thanks for linking up to #FridayFrolics. It can be a particularly good time, this age. There is so much development that goes on in the lead up to turning three – physical, verbal, personality – and you really start to see a glimmer of who they will become. Our third (and last!) turned three a couple of months ago and the realisation that what my wife and I call ‘the golden period’ between around 2.5 and 3.5 is fast disappearing forever.